I have yet to read any of Joe Hill's work except a short story called In the Tall Grass that he co-wrote with his father, Stephen King, but this looks good. I'm pretty sure I'll be checking it out. 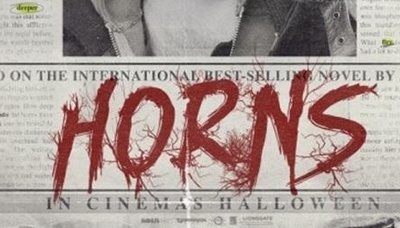 I like Daniel Radcliffe's acting and I haven't seen him put on an American access yet, plus Horns was filmed in Vancouver, which I love, and I enjoy watching film adaptations. I will likely read the book before seeing the movie. I definitely wouldn't call it horror or thriller. I'd say it was a fantasy comedy. It looks pretty cool. Dan Radcliffe's sounds quite different in this. Had I not been watching, and just listening, I wouldn't have realised it was him. I might go and see this. I hadn't heard of it until now but it looks really interesting. I'll watch it.